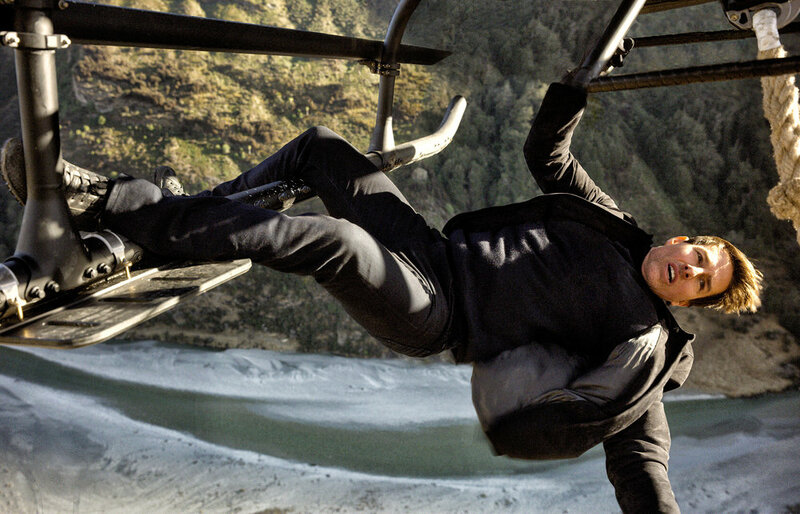 Is this the best Mission: Impossible movie (yet)? Anton: I consciously crafted our lead-in question to sound like a movie critic’s plug, but I actually think it’s a legitimate question to discuss in regards to Tom Cruise’s Mission: Impossible movie franchise. I can’t think of another movie franchise that has grown quite like Mission: Impossible, which seems to have only improved with each subsequent film. In my estimation, Mission: Impossible really hit its stride with the fourth film, Ghost Protocol, when the franchise solidified the core team and started to feel really comfortable in its own skin. Don’t get me wrong. There are aspects I admire about all six Mission: Impossible movies. Each of the first three films possess their own particular delights. Brian De Palma gave us a post-Cold War Euro-thriller thematically haunted by betrayal. John Woo made Ethan Hunt a Bond-like archetypal hero in a story that replays Hitchcock’s Notorious. And J.J. Abrams made things personal, bringing Hunt’s family life to the fore of the plot’s tensions. That said, while I admire aspects of each of the first three films, none of them strike me as entirely comfortable in their own skin—as being confident to simply be a Mission: Impossible movie. The first three movies all rely heavily on echoes of other movies and genres in order to invest themselves with a sense of purpose and worth. But with Ghost Protocol, the purpose was simply to be a great Mission: Impossible movie, and the film’s worth came in performing that function. With Ghost Protocol, it seemed that the filmmakers were finally content to send the team on a mission, and yes, with a particular twist—this time, the IMF has been disavowed. So, while I like aspects of all six films, the last three are almost a second series built around Tom Cruise and a few main set pieces and crazy stunts. Anders: I can understand why someone would like Fallout the best out of all the Mission: Impossible films: it’s a non-stop action delivery system. Honestly, I think it might be the best pure action film since Mad Max: Fury Road. The various sequences only grow in my estimation rather than diminish. It’s impressive that the sixth entry in a series can even seriously be talked about as if it were the best and it not be a joke! Personally, I still think the first film is the best one. Upon revisiting it before Rogue Nation a few years back, I was impressed by how solid it is from the get go. The way it dismantles the notion of it as a straight TV-show adaptation is brilliant (though die-hard fans of the original TV series still can’t forgive it for making Jim Phelps the villain). It has a Hitchcockian vibe, not only because of DePalma’s Hitchcock obsession, but by playing the “wrong man” trope out. The Langley heist is an all-timer and the editing and narrative manipulation as Ethan pieces together what has actually occurred is complex and brilliant, putting it a notch above other summer blockbusters. However, Fallout clearly shows how the last three films have become a series almost unto themselves, even if I think that at the same time perhaps the callbacks and continuity might be its biggest misstep. I think Sean Harris’s Solomon Lane was a great villain, but this is the first time we’ve got a villain coming back. I’m happy to have Ilsa Faust (Rebecca Ferguson) return, but could have lived without the return of Ethan’s ex-wife, Julia (Michelle Monaghan). To its credit, some of the best bits of the new film are some of the new characters. I think we’ll get to Henry Cavill’s August Walker, but The Crown’s Vanessa Kirby is standout as the White Widow. Aren: Vanessa Kirby is stunning here. Not only does she look fabulous, but she also seems to be having more fun than maybe anyone else on screen (Cavill excepted). Additionally, in her few scenes with Tom Cruise, there’s a more palpable romantic tension than I sensed during any other moments in the entire franchise. Tom Cruise is not an actor with much credible romantic energy, so to generate as much heat, so to speak, is no small feat. As to your question, Anton, is Fallout the best Mission: Impossible movie? It might be, but I thought the same thing after watching each previous entry. This might be the only franchise where I think every single possible ranking of the films is valid. I tend to prefer the most recent three films to the first three, but that’s also because they’re more firmly a franchise and wholeheartedly embrace what I think is the real standout with this series, which is the action. I don’t think the first three films had a franchise identity in mind, so they were more about the interests of their directors than about some overarching themes or artistic vision. The first film seems like a deliberate subversion of the “based on a TV show” movie and is almost adamant about refusing to play as a franchise. Of course, it proved too popular and Mission: Impossible II exploded that popularity to newfound heights. That film let John Woo indulge in some Hitchcockian storytelling while playing with his gun-fu action scenes. It’s probably the least successful of the films, but it’s also the one I haven’t seen in the longest time. Mission: Impossible III was the first theatrical example of J.J. Abrams playing with his action-as-character ethos, spinning a personal tale out of a hyperkinetic action film. None of these films connect to each other as easily as Ghost Protocol, Rogue Nation, and Fallout. Of course, they weren’t engineered in the same way these new films are. In terms of the stunts, Fallout is probably the most impressive overall. The Burj Khalifa stunt from Ghost Protocol remains the most individually impressive stunt, but the combination of the HALO jump, the motorbike chase through Paris, and the helicopter chase through the mountains of Kashmir is more cumulatively stunning. In terms of story or thematics, Fallout teases at more depth than any film but Mission: Impossible III, but it’s almost perfunctory considering that we watch these movies for the stunts. And the stunts in this individual film are spectacular. In addition to the John Wick franchise (which I know you’ll disagree with, Anders), this is the best American action franchise. Anton: I was sad to see Jeremy Renner exit the team without mention. But, at least we got Henry Cavill. Aren: And his glorious moustache. Anders: Henry Cavill is fantastic in the film. I can’t think of another actor who combines a massive physical presence with a magnetic on-screen persona in our the moment quite the way he does. Personally, I think he’s underrated by many as Superman in the DCEU films (though that is partly due to the backlash against those films, and partly the screenwriting underutilizing his strengths). But in The Man from U.N.C.L.E. and now in Mission: Impossible – Fallout he is cementing his skill at playing a superspy. I’m all for giving the British actor the role of James Bond once Craig is done after the next film. I think he’s more than shown he’s capable of it. Cavill manages to bring both a naiveté and a headstrong brashness to Walker. He’s confident, but not always correctly so. He’s willing to rush headlong into a fight like a bull in a china shop, but also prone to be humiliated for it. His character’s betrayal in the film (it might be a spoiler, but it was kind of ruined in the trailers) works well, and sets him up as one of the most memorable secondary villains in the series. Aren: Cavill is wonderful and the moustache is an all-timer. He has swagger and charm, but he’s also physically imposing and capable of being surprised. He’s smug, but he’s also gullible, which is fun to watch. The whole double-switch with Benji (Simon Pegg) and Solomon Lane is especially fun to watch for Cavill’s bewildered reactions to it. Of course, even those reactions prove to be false, but Cavill still nails it. He’s a great nemesis for Tom Cruise, especially as they emphasize the size difference between the two actors. Tom Cruise is short compared to most movie stars, but compared to Cavill, he’s especially small. Anton: Which also makes their fight alongside each other against “Lark” in the washroom also good fun. The man we think is the bad guy (it’s unclear at this point in the film) practices kung fu, whereas Cavill fights with lumbering punches and Cruise is sheer kinetic energy. I loved Rebecca Ferguson’s Ilsa Faust in Rogue Nation, and I’m glad she’s back, but she’s given a bit less to do here. Anders: I’m happy for Ferguson to show up, since Ilsa Faust is definitely a good addition to the series, but in the end it’s almost disappointing that she doesn’t get to play as significant a role this time round as in Rogue Nation. I hope they bring her back in any potential sequels. Aren: It’s because she has her own narrative that happens to overlap with Ethan’s, as opposed to in Rogue Nation, where she’s at the centre of the narrative. She’s a good addition and they’d be wise to bring her back again for the next film. I’d like to see her more clearly as one of their allies though, as they’ve really exhausted the whole “whose side is she on” angle by this point in the series. Anders: It seems like the supporting crew has finally settled in, with Benji and Luthor (Ving Rhames) as the longest running members of the IMF team (of course, Luthor is the only character other than Ethan Hunt who has appeared in all six films!). I’m fine with the occasional swap outs, though I do think that Jeremy Renner was much more enjoyable in Rogue Nation than in Ghost Protocol, since he’s best when he’s allowed to show his sense of humour. Anton: I think that’s the core now: Ethan, Benji, and Luther. And then we can have interchanges. I’d be happy if Ilsa was added in, if they do a seventh. Aren: It’s important to remember that Renner was originally added to Ghost Protocol because there was a brief notion that Tom Cruise would retire Ethan Hunt after that film and hand over the franchise to Renner. Of course, after that film’s success, they realized that Cruise is essential to these films’ appeal, so they reframed him as the centre of the franchise and Renner became less important. I don’t mind his absence for most of the film, although I do wish that he showed up in a coda at the end as the new director of the IMF. That being said, I’m happy with Renner pursuing more serious films again, like Wind River, and avoiding the blockbusters. He wasn’t even in Avengers: Infinity War, so clearly he’s not so enamoured with big Hollywood at this point in time. Anton: On something of a side note, the main action set-piece from the middle act of the film—the ambush to bust out Solomon Lane in the streets of Paris—echoes aspects of the delivery of the Joker in Christopher Nolan’s The Dark Knight. I’m mostly pointing this out to show how The Dark Knight seems to have settled firmly into the action canon. Skyfall also echoes many aspects of Nolan’s film, with the capture of Silva resembling the capture of the Joker. Anders: Oh definitely. The whole idea of a villain allowing himself to be captured is a pretty common trope in the decade since The Dark Knight, which is one of the most influential films of that time period. It also appears in Star Trek Into Darkness among others. Aren: The Avengers is the other big one. Anders: What’s interesting here is that the whole chase sequence also echoes the pacing and action set up, with the recessed freeways of Gotham (aka Chicago) being replaced by the tunnels and riverside roads of Paris. I should say, I did love the visual of the scene when Lane’s prison vehicle is pitched into the Seine and we get the shots of the waves entering the vehicle and rotating above him. There are some nice touches in the way that the action is edited in this film that go a long way to making it more than just sensory overload. Anton: Yes, there’s a clarity to Christopher McQuarrie’s action visuals. Of course, the IMAX sequences are also astonishingly clear and clean. We can take everything in. When you are shooting in this mammoth format, why waste it on a ceaseless barrage of quick cuts? I’m glad they avoid that pitfall. Aren: The Dark Knight continues to be the holy text for modern blockbuster action films. Skyfall is probably the best film to incorporate elements of its structure, plot, and tone (and the only copycat surpassing The Dark Knight, in my estimation), but several others have used it as a key influence. I think that Fallout does well to incorporate some of the editing and action elements of The Dark Knight, specifically during that rescue of Lane that you mention, Anders, but I don’t think the film necessarily thrives off of the psychological/philosophical examination of Ethan Hunt as The Dark Knight thrived off examining Batman and Skyfall Bond. This isn’t because Fallout isn’t interesting in a character sense, although I could’ve done without the dream scenes, but because Ethan Hunt is not nearly as interesting as Batman or James Bond. Furthermore, Mission: Impossible is not a franchise that thrives off of character development. It’s more plot-heavy and action-oriented, so trying to add depth and thematic weight to the characters cannot be as successful as with Batman or Bond because those characters have a legacy and a more character-heavy portrayal to dig into. Anders: I think you’re completely right, which is why Fallout’s need to try to address Ethan Hunt as a complex character, commenting on his past relationships, sense of duty, etc. feel a bit forced. Anton: I didn’t find it overdone. I like the dream sequences, which are done in such a way that we only gradually discover that what we are watching is a dream: I’m thinking of the initial wedding scene, and then the vision of how the ambush would play out. I think both are visualizations of the negative consequences of actions, and I think the thematic emphasis on consequences, the “fallout” of what we do, makes perfect sense for this particular story as well as for such an action-focused action movie franchise. And that’s why it makes sense for Solomon Lane to return in this film, since his being alive is a consequence of Ethan’s refusal to simply kill him. His return is an adverse consequence. Likewise, the plutonium is only stolen because Ethan choses a team member over the mission. But, with Ilsa’s eventual aid, the way that Ethan’s wife comes back into the story, and other elements, the film also explores the non-adverse side-effects or positive repercussions of Ethan’s essential morality. It’s an argument for spies having a moral compass in what is an amoral kill-or-be-killed world. There might be positive fallout for doing the right thing. Aren: We have to talk about the stunts because they’re the film’s (and series’) biggest appeal. The HALO jump might be my all-time favourite stunt in one of these movies, even if I admit that the Burj Khalifa scene is probably more impressive, as I mentioned earlier. The way that the screen expands in IMAX once Ethan opens up the aircraft ramp is impressive. And as a person who hates heights, the view staring straight down through the thunderstorm to Paris below is horrifying. But once you get Ethan rushing after Walker and the camera tracks backwards and falls off the ramp, with Ethan following and jumping off the plane, staying in the centre of the frame, it’s so impressive. I love that the film goes out of its way time and again to remind you that, yes, that is Tom Cruise jumping out of an airplane and falling through the air, and that is him riding against traffic at the roundabout around the Arc de Triomphe, and yes, that is Tom flying that helicopter that is barrel rolling over the mountains of Kashmir. That the scenes are also exciting and well-constructed action scenes help, but the impeccable stunt work and action acting do the heavy lifting here. Anders: I think the HALO jump is one of the most impressive stunts (along with the Burj Khalifa one) in part because the pre-release marketing made a big deal about the fact that they really did it. I think they do a good job of integrating it into the story, but the Burj heist and Langley heist are more entertaining in terms of suspense. That said, I also didn’t watch the film on IMAX, so I’m sure the HALO sequence has an even more visceral impact in that format. Anton: I found the helicopter chase particularly impressive. The crispness of the shots on IMAX, the fact that we can see Tom and the Kashmiri mountains behind him and it’s clearly not a green screen, made it very engaging. It adds to the sense of urgency and danger that a well-constructed action scene, even purely CGI, should generate. Aren: Of course, this all leads into a discussion of Tom Cruise himself, who seems to have a death wish while also wanting to live out that death wish in front of a camera. Anders: The funniest thing I saw the other day was one of those WIRED Google complete promotions with Cruise and each one was asking “Can Tom Cruise…” and the autocomplete was like “sing,” “fly a plane,” “rock climb,” and of course in each instance he was like “well, yes, actually I am a commercially-licensed pilot,” “I trained for months to become a rock climber.” It was hilarious in the absurdity of how many skills the guy actually has. Aren: I have this theory that the stunt work and Tom Cruise’s status as the world’s last movie star go hand-in-hand. Franchises and superheroes have taken over movie stars in our current entertainment world and Tom Cruise is probably the only star left who can guarantee a massive global return (Dwayne Johnson is probably the other star who may be able to claim that) while also having old movie star appeal (unlike Johnson). Instead of reading his stunt work as a death wish or as a mea culpa for his weird personal life and PR missteps in the past, I read it as his savvy way of exploiting his status as a movie star to activate our suspension of disbelief in an era where movies seem entirely fake. Anton: It’s also worth noting that Cruise’s status as producer and his long-record of box office clout also mean that he’s in a position to take the risk of doing his own stunts in risk-averse Hollywood. I don’t think most productions could be insured if the star was doing the stunts. I don’t know the legal details, of course, but that’s my hunch. Tom Cruise really is a unique property in Hollywood today, and he’s leveraging his star status very well. Aren: I was chatting with a friend about this earlier in the week and I basically talked myself into believing that Cruise understands that the appeal of seeing a great stunt hinges on the fact that we know a real person is at the centre of the action. This works when it’s a stunt man but it works even better when it’s a movie star that the entire world is familiar with. Most blockbusters nowadays use spectacle to invest the viewer in the narrative. They want to dazzle with stunning images and use loud noises and fast camera movements to engross the viewer and overcome people’s general detachment from reality and fiction in particular. Even blockbusters that emphasize practical effects, like the new Star Wars movies or Christopher Nolan’s films, don’t use stunt work in the same way as Cruise. Cruise is smart enough to understand that people are motivated by their emotional connections to the material. He also knows that people have an automatic emotional connection to him, regardless of whether they like him or not. Even if they hate him and think he’s a weirdo because of his Scientology, they have an emotional reaction to him, which he exploits in his action films. By inserting himself into massive action spectacles and making sure that viewers are aware that he’s physically performing the actions on screen, he activates that emotional reaction, which tells viewers that an actual human being that they know is real (because they have strongly-felt opinions about him) is in the scene, which ultimately tells them that what they’re watching is real. It erases the boundary between fake blockbuster action and real stunts, which is what all movies want to do, but few can accomplish. In this way, Cruise uses his own status as a world-famous movie star to exploit our suspension of disbelief and make the film that much more exciting for us. He may have daredevil impulses, but he also is a consummate showman and knows the best way to use his persona to put on a good show. Perhaps I’m over analyzing it and giving Cruise too much credit, but the man understands moviemaking and knows how to use his image to his advantage. Anders: I don’t think you are. I don’t doubt that Cruise is conscious of this on at least some level. He’s a showman and mostly a shrewd producer and judge of material (the most recent Mummy movie aside). He really is our last true movie star! Anton: The best thing the Mission: Impossible series ever did was to build their films around Cruise and his stunts. I wonder what he’ll do in the next one? Written and directed by Christopher McQuarrie; based on the TV series by Bruce Geller; starring Tom Cruise, Henry Cavill, Ving Rhames, Simon Pegg, Rebecca Ferguson, Sean Harris, Angela Bassett, Michelle Monaghan, Alec Baldwin, Vanessa Kirby, Wes Bentley.